We will meet at Pioneer Square, and then head up to the aerial tram to see some captivating views of the city. After the tram we will head to two more rooftops to see Portland from some different angles. All transportation will be included in the price of the ticket. 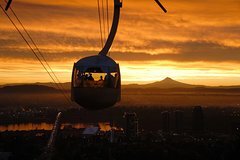 We'll meet at a convenient location downtown and then head to Portland's Aerial Tram to capture some stunning photos of the city's skyline. After a short excursion in the clouds, we'll visit a rooftop in the Pearl District. There you can enjoy views of the unique architectural styles present in Portland, from a gold level sustainable rooftop, tastefully restored from a 1895 warehouse. The 3rd and final viewpoint takes place at a hotel in Chinatown, where you can order tea, coffee, beer or mimosa on the a captivating roof a 1881 former sailors boarding house. My weekly work schedule allows for flexibility and I am open to moving things around, so if you have a different time in mind, please don't hesitate to ask. *Note: The rooftop in the Pearl is unfortunately closed outside business hours. Tours outside office hours won't include this location and will be replaced with another rooftop/viewpoint. *Depending on the size group we make take public transportation, Lyft or private car.